The Mohawk hairstyle is alternatively recognized as Mahican hairstyle. 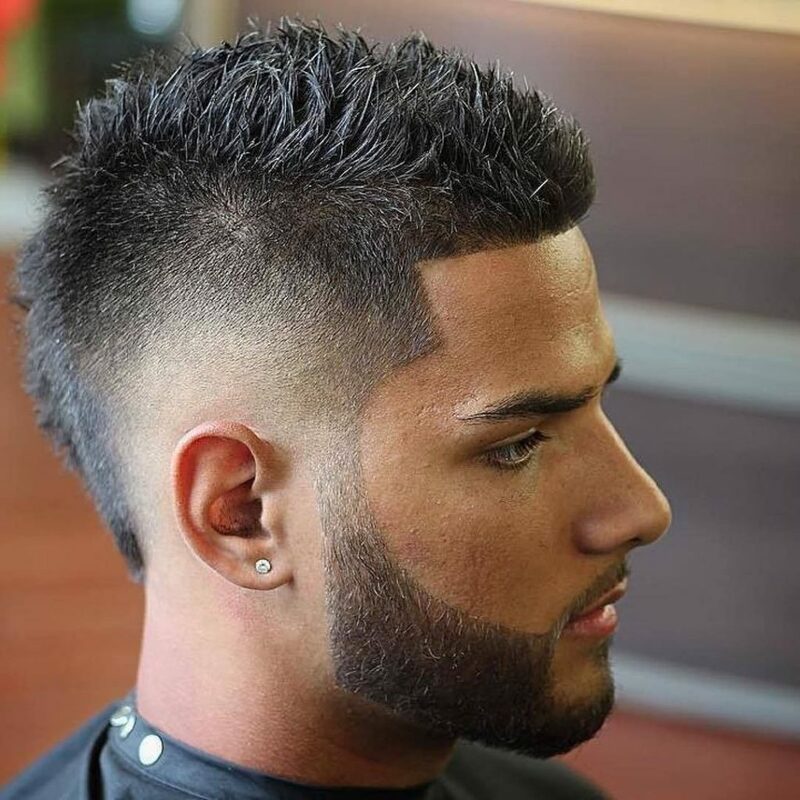 This style is regarded as one of the coolest hairstyles among men.In this style, the hair located on the two sides of the head is basically shaven. They are shaven continuously upwards. It is done such that it leaves a strip of long hair within the middle part. It is known that these hairstyles could be found all through the history. Moreover, Mohawk hairstyles for men are closely connected to the tribe of Native American Mohawk Indians. It is often found that many men make use of hair color to get an added assertive look. This look is applied to Mohawk hairstyles. Now, it is no secret that men adopting incredible Mohawk hairstyle look insanely striking. However, the actual concern is that there are several different types of hairstyles. These hairstyles are difficult for any man to point out what hairstyle to accept. In this matter, the good news is that now there are few of the trendiest styles available. Let’s have a look at them. This Mohawk hairstyle possesses effect of comb-over in its styling. It is essentially an edgy one, defined by a sharp line. This line works to distinguish between undercut present at top and back and sides. Here, the sides mean the sides which are shaved clean adjacent to the skin. The long hair present on the top side is usually styled through a spray. Later, it is combed over to the side.This hairstyle is dedicated for men wishing to flaunt an inspiring Mohawk hairstyle. In this style, the taper fades as well as the comb over is finely combined. This is done to give a dramatic Mohawk style. This Mohawk hairstyle is regarded as one of the famous Mohawk styles. In this style, the long hair is basically tapered straight upward from the head’s middle part. The hair is tapered with the sides possessing a high fade to create prominent contrast.Men willing to wear the style during the night but need to be disguised by day, go for this. Moreover, it can also be styled with a vertical spike. The spike is accompanied by the head. This latest Mohawk hairstyle works to offer a fashionable look. The final look would be such that it will help you look unique among the crowd.It adopts a clear taper fade and in these two lines are etched in as per the design. The style is accompanied with bleached highlights or an even dyed hair over the top. It works to combine trendy and edgy look.The high skin fade works on curly hair as well. It can entirely convert the curly Mohawk to something chic. This is the haircut which depicts how smooth and stylish long hair can be. Through the use of the correct product, it’s simple to manage long locks. In this Mohawk style, the upward shaven hair is kept long. Men with the unique look, for them, the long men’s hairstyle matches with messy pomp. It is paired through braid for extra texture. This style is enhanced form as compared to any usual Mohawk fade. The reason behind this is it highlights the racing stripes. The style requires less time to prepare.The focus is made on a collection of lines going along the sides and to the downside after your ear.It gives a unique, dark, tall, and handsome look. If a man is a fan of the conventional Mohawk, this creative Mohawk fade works to satisfy him. It works to blend Mohawk with a slight of a tail. Spike has been prevalent all around. The spikes are incorporated into Mohawk styles as well. In this hairstyle, the tall, spike and extensive Mohawk is used. This expands along the entire scalp, depicting short length at the back. The sides are kept undercut and not faded. However, the short side segments are merged through the spikes. 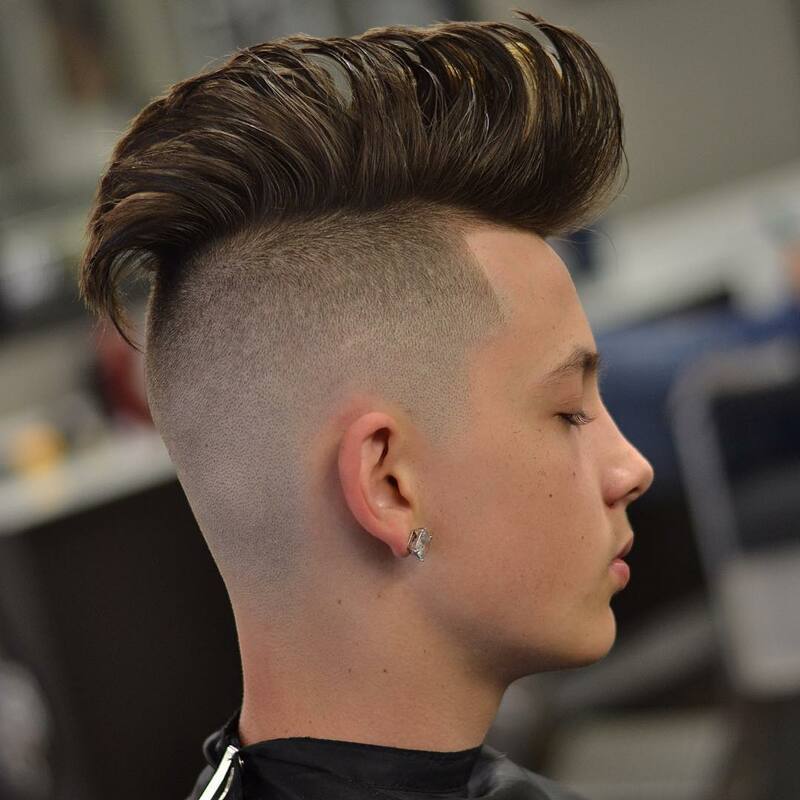 The blend is done perfectly in a way that men can refer to high fade.It is known that long hair can manage this spiky Mohawk undercut in a fashionable way. Besides, the present Mohawk style would require long hair to be blown directly to the sides kept short. A conventional buzz cut is evidently short and is recognized by hair which is clipped close to head. It is clipped with a razor. If one is looking for the finest Mohawks to wear but has no intention to shave or buzz the head, go for this. In reference to maintenance, this buzz cut is the simplest haircut.The reason is there is practically no grooming. However, the only issue you need to be careful is the size of your face. Some men are blessed with natural curls,and they can adopt this style quickly. However, those who are not blessed with natural curls can try to have this style. Men having naturally curly hair would appear great with this style. In this style, you can apply a quality product for including texture to the hair. This helps a man to look neat and clean. Those men possessing long hair can too wear this style to look fashionable.It is known that you can flaunt a variety of undercut based hairstyles. The reason is it can function well for men having curly or straight hair. The process of getting and preparing the finest Afro hairstyles for males must not be boring search. Amongst many Afro hairstyles, Afro style for Mohawk cut is considered as the best. You can try this hairstyle for long, short, and curly hair. Nowadays, black men possess tons of options when the matter comes to making the dope look. In this hairstyle,high volume of an Afro is blended with shaved and short sides. This makes an eye-catching Mohawk style. This hairstyle is regarded as a contemporary retelling of a classic hairstyle for men. The Pompadour Mohawk is presently one of the greatest versatile and chic hairstyles. The fundamentals stay the same. This is because the style is identical to usual Pompadour, applied on simple hair. The only difference is that the style is applied to Mohawk cut. It is suitable most during the summer season. The textured crop is regarded as one of the topmost trends during last year. The similar kind of trend would continue in 2018 too. The style is a flexible one which could be cut light or heavy. It can also be kept long or short, bold or classic.If your hair is naturally textured, you can try this. However, if not, you can finest make it textured and then apply the Mohawk cut. Lastly, finish the look through the use of taper or fade haircut. You can now choose for a low fade-based haircut in order to add length to hair.If you are crazy about adopting low fade on short length hair, go for this Mohawk cut. It gives you a clean finish. The haircut can be presented with many variations. Hence, you need first to check whether low fade suits you or not. It matches well irrespective of your hair type. You can apply it on thin or thick, straight or curly look. This contemporary Mohawk cut is regarded as a clean and polished cut. The style works to give a look containing a high volume of hair. This is especially useful for men with thin hair. The reason is it helps to let your hair look thick, giving it a complete appearance. You need to be careful about not to get bored while applying this style. This is because many men found a voluminous style to be tedious. You need to apply volumizing spray on wet hair. Also, apply water-based pomade to get a clean look. The style is basically a faux hawk type with Mohawk cut applied to it.In order to style a Frohawk Mohawk, you should begin by towel drying the hair. Men who have tried this suggested that they used some styling products. This includes wax, hair gel, pomade, etc. In this style, you would run your hands through the hair, spiking the hair upwards. The hair is flattened over the sides as well as on top. Hence, only those hairs present in center part is spiked up. The short Mohawks can too be outlined by managing abroad strip of hair within the middle part. The present Mohawk hairstyle is slightly more edgy and rough. Besides, it can be grown out through simplicity in whichever manner you prefer. If you desire an extraordinary blow through a sleek Mohawk, the hairstyle is for you. In this, the eye-catching look is dyed by the sleeked back top. This offers impeccable look for many occasions. Mohawk Hairstyles for Men are considered to be a collection of style, rebellion, and culture. The styles are identical to the feathers of huge birds. Hence, overall, they work to provide you a unique and stylish look.